REITs are one of the more complex sectors. This article will dig into how three, specifically, do business and make money. The Real Estate Investment Trust sector consistently garners a ton of attention due to its high dividend yields. Deciding which REIT is the best investment, however, involves some hefty due diligence. 1. What type of securities does it buy? ARMOUR buys exclusively "agency" residential mortgage-backed securities: loans packaged by Fannie Mae, Freddie Mac, and Ginnie Mae. Javelin and Two Harbors, on the other hand, have about an 80/20 mix of agency and non-agency RMBS, respectively. There are two major differences between agency and non-agency securities. First, agency securities are guaranteed even if loans default, while non-agency securities are not. Second is the type of loans it secures. Fannie Mae and Freddie Mac have specific guidelines for the type of loans it'll buy from banks. These are called "QM", or qualified mortgage loans. Mortgages that fall outside the QM box aren't necessarily bad loans. These include, among others, large loans to credit worthy borrowers, or "prime", and lower credit quality loans classified as "subprime". Since these securities don't come with a guarantee, they have a higher yield to compensate risk. 2. How leveraged is it? The yield on agency RMBS normally range from 2% to 5% -- which is fairly low. So, to increase profit, REITs will borrow using repurchase agreements, or REPOs, to build a larger portfolio. Leverage is how many times the company borrows against its equity. On average, REITs will borrow between three and 12 times its equity. The greater the leverage, the greater returns and losses are magnified. This is most simply displayed in the companies debt-to-equity ratio. Most striking is the difference in leverage between Javelin and ARMOUR compared to Two Harbors. This is due to a difference in investment strategy. Javelin and ARMOUR buy safer securities, and can, therefore, afford to take on more leverage. Two Harbors, presumably, takes on less leverage because it takes more risk with its non-agency securities. 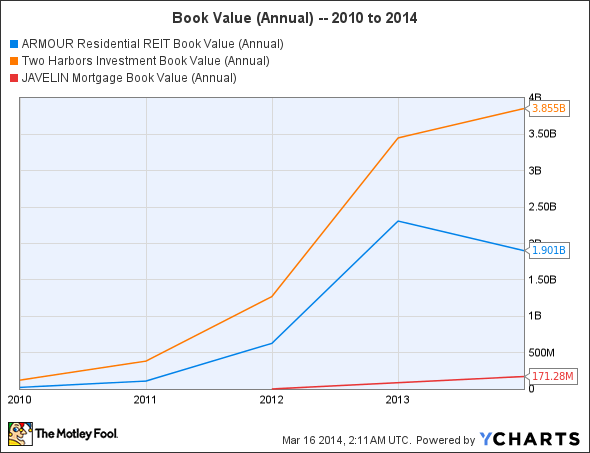 REITs earn the difference between how much it costs to borrow and the yield on securities. This is referred to as the interest rate spread: the greater the spread, the better. Non-agency securities, as mentioned, have higher yields. This is reflected in Javelin and Two Harbor's higher spread. Two Harbor's yield is especially high due to a high concentration in sub-prime mortgages. ARMOUR compensates for its low spread through higher leverage. 4. Does it protect book value? There are myriad operational risks in this sector -- and that's ignoring outside risks like the winding down of Fannie Mae and Freddie Mac. Hedging is used to limit these risks. While you could dig into strategies for using derivatives, it's easier to look at book value. The ultimate purpose of hedging is to protect book value. Therefore, management with a history of preserving and growing the company's book value is often a better bet than one that hasn't. ARMOUR Book Value (Annual) data by YCharts. Javelin and ARMOUR are both externally managed by ARRM. So, while Javelin is still fairly young, we can gauge what management would do by looking at ARMOUR. And recently, ARMOUR has been hard at work selling off securities -- about $15 billion worth in 2013 for a net loss of $600 million. While this had a negative short-term effect on book value, the company explained it was done to reduce exposure to a volatile market. Two Harbors, on the other hand, has handily managed to grow its book value since 2010. While there's still plenty of work to be done, answering these four questions should help guide your investments in the right direction. In this investors opinion, Two Harbors looks like the most interesting investment of the bunch. The company operates with strong margins, and it's showed substantial book value growth while competitors were pulling back. And, ultimately, the company's strategy seems like the best fit to manage the rising interest rate environment.